Do you like the feel of a small and cozy campground? Then you’ll love Yellowstone Cabins and RV! We have just 6 RV sites. Each one of our pet friendly RV sites are back-in and can accommodate RVs up to 40 – 50 feet in length. All sites come with full hookups and free Wifi available in common area. Want a real shower? Of course you do! Our campground has 2 community restrooms with full size showers. Need a great place to grill but don’t want to drag yours out? Well then, you’re in luck! We have a community picnic area, complete with gas grills and picnic tables. Finally, you won’t want to miss our new community fire pit. It’s the perfect spot to kick back, roast some marshmallows and make new friends. Traveling with friends who don’t have an RV? Then, be sure to check out our vintage cabins! 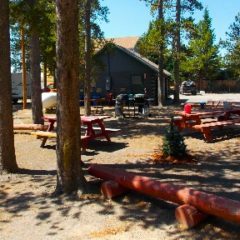 Yellowstone Cabins and RV boasts original cabins built in 1946, each with its own private restroom, microwave, mini-fridge, satellite TV and free Wifi in common area. Yellowstone Cabins and RV is in the perfect spot in West Yellowstone, MT. It’s just one mile from the west entrance to Yellowstone National Park. The town is small so your site is just walking distance to all the town’s souvenir shops, fly fishing shops, restaurants, museums, entertainment and more. Enjoy your day in the park or in the town knowing you have a cozy, comfortable, convenient place to return to. Why not make us a part of your authentic Yellowstone vacation experience.